The Independent National Electoral Commission, INEC, may have wasted yet another opportunity to showcase its readiness for a system which guarantees hitch-free elections in Nigeria as inadequate preparation, failure of equipment, poor staff welfare and poor mobilisation of logistics almost undermined the Anambra gubernatorial election on Saturday. According to a preliminary report of the election by the Centre for Democracy and Development, CDD, and PREMIUM TIMES, some of these challenges were observed in various parts of the state during the election. The election may also have been an indication of what to expect in the 2018 Ekiti and Osun states elections as well as the 2019 general elections. INEC Chairman, Mahmood Yakubu, had in October assured Nigerians that his team had put in place measures to ensure a hitch-free election in Anambra. "The preparation we have put in place for Anambra is simply amazing. We have done all that needs to be done to ensure a successful outing. We have finished printing the voters' register in triplicate. One is in colour, two in black and white", Mr. Yakubu said while addressing a session with civil society organisations in Abuja. However, despite Mr. Yakubu's assurances, many anomalies were observed during the elections some of which may have affected the low turnout of the election. Elements of irregularities started manifesting on Friday, a day to election, when some ad-hoc staff, already trained for the elections, could not ascertain where they were posted to as their names were missing on the INEC list, the CDD report stated. Then, on Saturday, the non-provision of welfare packages for members of the National Youth Service Corps, NYSC, key officials of the process, delayed mobilisation of election materials. "Corps members at the Nkpor Registration Area Centre in Idemili North Local Government insisted they be paid their feeding allowance before setting out for the day's business," the report stated. Turnout in Idemili North after final collation of results turned out to be 14 per cent; a factor that may have been influenced by the late arrival of the corps members to the polling units. INEC is statutorily responsible for the payment of allowances of ad-hoc staff participating in the election. It did not complain of non-availability of funds to pay officials in the preparation leading to the exercise. Arguments over the payment started early Saturday morning with the corps members, designated as presiding officers and assistant presiding officers, dramatically delaying the movement of election materials to polling units. Again, the corps members were stranded after resolving the issue of allowances as drivers who were supposed to convey them refused to show up. More worrisome is the issue of non-provision of adequate security raised by some of the corps members. At the Registration Area Centre, RAC in Otolo Nnewi, corps members expressed reservations about going for the elections without security details attached to them, the report stated. Their fears were understandable as corps members have been attacked and killed in past elections in other parts of the nation. For the umpteenth time, electronic verification of voters failed in many parts of the state. In most of the polling units, the card readers simply failed to capture fingerprints of electorates and INEC ad-hoc staff resorted to the manual mode of checking the voters' registration list and use of incidence form for accreditation. This stretched the already allocated time for the process. "At ward 1, polling units 002, 003, 004, all at Saints Primary School Onitsha, voters were delayed for accreditation over failure of the card readers," the report stated. The same happened at the Bishop Patterson Junior Seminary Mbosi Ward 20, polling unit 004, polling unit 003, Ubuluisiozor ihiala LGA, polling unit 003 St Peters Ogidi and several others. Meanwhile, Mr. Obiano was also unable to use the card reader at his Eri Primary School, Unit 004, Otuocha 1, Aguleri, polling unit as the machine malfunctioned. This did not align with promises made by INEC in the build up to the elections. Speaking before the Senate Committee on INEC in October, INEC boss, Mahmood Yakubu, told the lawmakers that INEC has made improvements on the electronic card reader system to ease accreditation in the Anambra election. "For Anambra election, we will deploy the existing card readers in terms of management but in terms of technological enhancement of the card reader, we will make sure that the processes are involved. We are working seriously to improve the card readers not only to make accreditation faster but to also enable us translate results electronically from the polling units", Mr Yakubu had said. There were also cases of ballot box snatching in some polling units across the state. The report highlighted one such case at Idemili Local Government Area. Accreditation and voting was disrupted as two unknown men stormed the Amaugochukwu Hall 1 polling unit. INEC officials were reported to have fled the scene with ballot papers, fearing for their safety. They later returned to discover that the card reader and ballot boxes had been carted away. Meanwhile, agents of different political parties on Saturday openly distributed food and cash gifts at polling booths to sway the support of voters. The report stated that observers witnessed agents of the ruling APGA, All Progressives Congress, APC, and the People's Democratic Party, PDP, either giving cash or cooked food as 'gifts' to voters. In some cases, voters simply handed over their voter cards for money. Some of the examples highlighted in the report include at Illo Abito square, Nsugbe, where the APC gubernatorial aspirant, Tony Nwoye, voted. People received cooked rice as 'encouragement' to vote, the report stated. Also at the Okija Ward 2, PU009, Umuohi Community Primary School, observers witnessed suspected agents of the PDP, APC, and APGA wooing voters with cash. Some voters did not even wait to be approached, they demanded enticements before casting their votes for parties. Some of these cases occurred at Nnewi Ichi ward, Polling Unit 003, Polling Unit 008, Umudioka Primary School Awkuzu Ward 2 and some others. One week to the governorship election in Anambra State, the proscribed Indigenous People of Biafra, IPOB threatened voters with death if they came out to vote. They also vowed to disrupt the election. Resulting from this, the police authorities deployed over 21,000 personnel to the state. The civil defence deployed another 13,000 while the military also deployed personnel and resources to monitor the election. 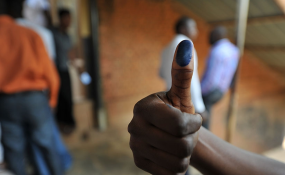 Although the election was largely peaceful, perhaps due to the large security presence, the report indicates that the heavy deployment may also have contributed to the low 22 per cent turnout in the election. "The army are conducting a thorough stop and search, they even asked people to go back in some cases, I just managed to come out", Ifeanyi Okoro, a voter, was quoted as saying. The authors of the report advised INEC to ensure the issues raised are dealt with before the elections in Ekiti and Osun states next year; and that the processed be perfected before the 2019 election. Already, some of the candidates who lost in Anambra have, though complained of some of the lapses raised in the report, congratulated Mr. Obiano for his victory.